As a Muslim who believes in Islam’s universality, inclusion and pluralism within the most extensive scope of Aalameen (Rabbul and Rahmatul), I have always questioned the judgementalism of fellow Muslims who have made Islam a restrictive, limited, narrow religion. God alone is the Malik-i-Yomiddin, which we recite at least 17 times a day in our daily prayers. No one can judge other person’s faith, not a single soul on the earth has employment as an assistant to God, an associate of God or deputy of God – he is la-shareek. We also believe that God is absolutely clear that there is no compulsion in matters of faith, again this can be a narrow definition or large to wear the Aalameen narrative. A true Muslim has no business and cannot look down upon another creation of God. Wallah Alam, only he knows what one believes and what is in one’s heart, and he alone can reward or punish the soul, not now, but on the Day of Judgment. Do we have the right to pre-empt God? Isn’t that Shirk, an unforgivable sin? Just live your life and let others live theirs, after all, you will not be questioned about the acts of anyone but you. I am not encouraging or supporting LGBQT lifestyle, but merely accepting it as fellow humans, who have the same God as I do. 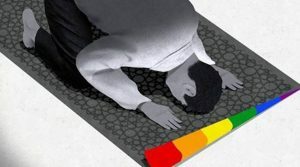 Beyond Section 377 Reaching out to the Muslim homosexuals, “The Queer Muslim Project” has now decided to extend its presence offline. What is the idea of Muslim World?